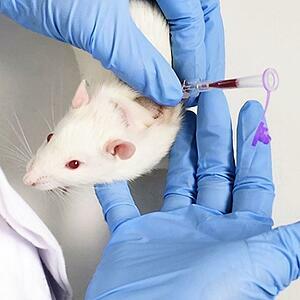 Many of the traditional methods of taking a blood sample from a rat or mouse leave room for improvement: pain and stress felt by the animal, samples contaminated with other fluids, the safety hazards of needles and bites. Instech’s Vascular Access Buttons™ and PinPorts™ dramatically simplify the sampling of pure blood from a catheterized rodent, either directly or outside the cage. Capillary / centrifugation tubes (Microvette® CB 300) include a carrier tube and anticoagulant so that the sample can be placed directly into a centrifuge, omitting the syringe and transfer step. Capillary / dispensing tubes (Minivette® POCT) collect precise 10, 20, 50, 100 or 200µL samples, with or without an anticoagulant, which are then easily transferred for analysis without a syringe. Now, thanks to Instech’s new PNP3MS connector, these product families can be used together. The connector easily presses on to both the dispensing and centrifugation tubes. The PinPort™ and Vascular Access Button™ are then automatically pierced allowing for a quick and accurate sampling of the blood. To see these combined products in action, watch this video. If you are already using Vascular Access Buttons™ or PinPorts™ simply request a free sample pack containing the Sarstedt tubes and the PNP3MS connector. If you do not have catheterized rodents in house but are interested in making the transition, whether for animal welfare, safety, sample purity or all of the above, contact us or the surgical services department of your animal vendor.